The resulting biscuits were so good that I felt rather shameful for not having made any for the last 30 years! I'll definitely not be leaving it so long again. The homemade version is way better than shop bought with a crumbly melt in the mouth texture and a generous vanilla buttercream filling. They also smell SO good when cooking. If you'd like them to have the look of those from a packet you can buy a stamp/cutter that will do the job. Obviously such an item has now gone straight on my kitchen equipment wish list! 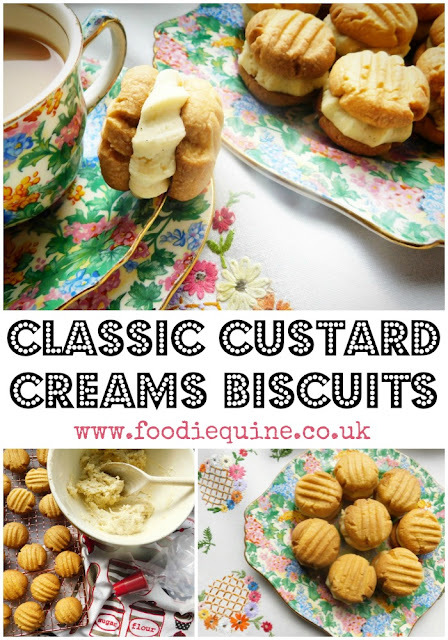 I hope you enjoy these Classic Custard Creams Biscuits as much as my family and the STAR Flat Community Cookery Class did. They would be great to make with kids as there's not too many ingredients and there's lots of fun to be had with the rolling of biscuit dough and the squishing with a fork. Cream together the butter and icing sugar then sift in the flour and custard powder. Mix well to form a soft dough and divide into 24 walnut sized balls. Place the custard creams on greased/lined baking trays and gently flatten with a fork. Bake for 12 minutes until lightly golden. Allow to cool on the baking tray for a couple of minutes before transferring to a cooling rack. Meanwhile cream together the softened butter, sieved icing sugar and vanilla bean paste to make your buttercream and set aside. When the biscuits are completely cool match them up into evenly sized pairs. Sandwich the biscuits together with the buttercream filling either using a knife or a piping bag and nozzle for a neater finish. These are perfect served with a cup of tea and you'll be hard pressed to stop at just one. I dug out my maternal grandmothers tea set to take these photos. Isn't it just a gorgeous chintz floral pattern? For those interested in such things it is a pattern called Somerset made by Royal Winton. For further homemade biscuit inspiration to accompany your afternoon cuppa take a look at these recipes - some of mine and some from my blogging colleagues. They look utterly gorgeous, I'm bookmarking and persuading Pete to make these for us ASAP! Oh my gosh. I was just talking about wanting to make these again and said i needed a recipe - Thank you! I know what I'm making this weekend. They look gorgeous!! These look so delicious, a million times better than store-bought! I'm going to have to say this...I don't like shop custard creams, they would be the bottom most bottom choice of biscuit for me, just sneaking in above the pink wafer. However, a good homemade custard cream is a thing of beauty and deliciousness and, like you, it is too long since I made them! They are so cute and I love the flavour!